Neil Helyard is one of our featured artists here at Trinity House, the way he captures the beauty of everyday life is truly extraordinary. Neil has been taking part in some interesting ventures this year. As part of the Hull 2017 City of Culture, Neil visited Bilton Primary School to hold art tutorials with pupils on portrait techniques. Every child went away with new found skills on sketching a human face and some lucky pupils also learnt how to sketch using charcoal. Neil will be invited back during the summer term to undertake some further mentoring. A little closer to home for Trinity House in the village of Broadway lies a very unique painting from the artist. The Cirencester Hare Festival is currently running a Cotswold Hare Trail with 80 to find in the area. The Lygon Arms have their very own called Charles First Hare to the Throne, painted by Neil. He stands proudly outside their main entrance on Broadway High Street, the trail runs until 10th September 2017. 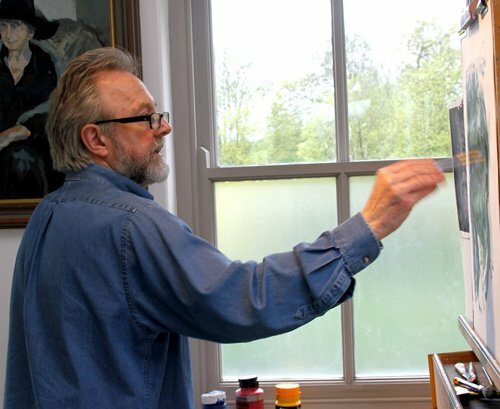 We look back at some fascinating footage of the award winning British artist. The short film shows Neil transforming a blank sheet of paper into the image of an old man’s face in a matter of minutes. It demonstrate’s Neil’s idea of painting from dark to light, working from black and highlighting outwards. After 15 minutes of brisk painting, Neil starts to add quick white highlights and the painting springs to life, out of the dark green, blue mix on the page a face starts to emerge – all this in front of the camera. Within 30 minutes a beautiful character’s face adorns the page, a face in the dark. Neil’s work is exclusively available through Trinity House Paintings.